Star designs have always been a staple in the tattoo industry. Some have significant meaning to individuals, and others just like the look of them. Nautical stars are a very popular design, and their meaning or significance has evolved over time. Sailors used to get these stars tattooed a symbol of safety, protection, and guidance. They were able to navigate based on the North Star, which guided them home with safe passage. Sailors aren't the only ones who get nautical star tattoos, and many people get them as a symbol of hope, guidance, or a symbol of home. Some people, especially in our region and within the younger generation refer to these stars as "nor cal" stars, as a symbol of pride in being from/living in Northern California. Stars can also be a symbol of ones faith or beliefs. The six pointed star, or the star of David, is often a symbol of Judaism. The five pointed star within a circle is called a pentagram, and is often associated with wiccan beliefs, or even satanism. Many people believe this symbol to represent the elements. Each point representing earth, wind, fire, water, and the spirit. Shooting stars are also a very popular tattoo design symbolizing a brief moment in someone's life that left a lasting impression. Others may get star tattoos to simply represent the night time. Stars can represent a goal you are reaching for, or something far off but within sight. A lot of people just get star tattoos for the simple fact that they like the design and the aesthetics. Whatever the reason for getting a star tattoo, we are happy to accommodate your designs and visions, and provide for you the best tattoo experience we can. 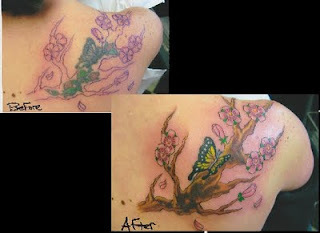 Change and partial cover up of Butterfly with roses in to Butterfly and Cherry blossom branch. Tattoo by Russell Kashey-Fortier at Lucky 7 Tattoo, Kings Beach/North Lake Tahoe, California. Me and "Rocker" Dave in 1985, around the time of our trip to "Biker Bobs Tat Shop" in Belmont, Ca. Way back in 1985 My rocker boyfriend and I went to the local biker tattoo parlour in Belmont, Ca. I was going to get something real tough, like a black rose with a tiny drop of blood hanging from its thorns. How punk rock! Rocker boyfriend was set on inking the Led Zeppelin Swan Song logo on his arm, you know the drawing of the male angel getting thrown out of heaven that was on their albums? Yeah, that one. Well Dave being the smarter of the two of us changed his mind after observing this "tattooer" and his shop. Me? Well I had a death wish, PLUS I wanted to show Dave how down I was for him, my bright idea was getting Dave's Swan Song design on me! Pretty punk rock of me huh??!! Well Dave wasn't as impressed as I had hoped, and shortly after, I moved to Tahoe and Dave moved on to other girls. After a number of years of rockin the Swan Song tattoo it was time for it to go. By the 90's I had become a body piercer, and had a clue as to what a good tattoo is. My boss at American Grafitti in Sacramento created a big, wonderful Queen from Disney's Snow White as a backpiece, skillfully hiding my tiny, ill conceived "Dave tribute/Rocker tattoo." As my boss shaded over my sad little tattoo he had a good laugh, and I blushed, and change was very good indeed. Moral of the story. If you have a tattoo that is dated, a name of someone you no longer date, or a tattoo of a butterfly that instead looks like a date you would buy in a grocery store, you CAN change it. Come on by Lucky 7, let the fellas show you want can be done to cover up and change that tattoo you no longer dig, or maybe never did like. Keep you mind open. Not all ideas work well, but plenty can be done to make you happy with your ink. Let me think about where this blog is going kids. I can take it. Follow us, and/or leave a comment for me. I sure would appreciate it. Kathleen @ Lucky 7 Tattoo and Piercing North Lake Tahoe, Ca. Working with your Husband and Ex-husband without bloodshed! the courage comes forth and out pops "How can you work with your husband and ex-husband every day !?! I couldn't do that!!! Back to the customers question of " HOW" we / I can all work under one roof. One thing enters my mind right away. Corey and I worked together for a year before we got that thought of dating / getting naked in our heads. He was coming off of a 6 years relationship. I had taken my first husband through a drama and boozed filled 9 years. We came into the courting relationship with some barely healed wounds. But hey, we both love to gamble, so we decided to give it a go. Always having a great time together. Laughing our tails off at the same inside jokes, dining on mexican taquaria food at 3 am. Still managing to keep an easy, fun - yet professional vibe at the tattoo shop. The two of us together made the others at the shop view us as a team so tight we were not to be crossed. So the base of our bond was solid from the git go. Three years later we got hitched Reno style, became serious about creating our own tattoo and piercing shop and got busy doing just that. igans are happening while still living under the same roof! Boy we sure knew how to not waste a moment and move on quickly...sheesh..! But a very curious and really wonderful thing did take place. Both of us held our tongues! Except for early on in the split, a few brief moments during a disagreement, NO INSULTS passed between the two of us at anytime, anywhere. Not one truly terrible thing (the kind of hurtful statements you can never wipe away) was ever verbally thrown in anger at the other. No snide comments about the other said in haste to a mutual friend. Together and separately we behaved like mature adults! Lucky 7 was still so young. Our joint dream was still alive and kicking in our hearts. The only way Lucky 7 could continue was with us as a team. Our other option, to allow our shop to fade away before it got off the ground, was not okay with either of us. Somewhere within us both we gathered the manners and smarts our mommas gave us and we carried on! Neither of us listening to the well intended advice of concerned parties telling us it couldn't work. To hire expensive lawyers and put each other through the divorce court ringer. Instead we just did what we do really well together, we worked day in and day out to keep the business growing! Now let us all fast forward- past my very brief, ill conceived marriage to THAT tattooer. Running swiftly across the mucky shores of Corey's much too expensive dalliance involving THAT dimwitted teenager in a training bra. Together we land in Summer of 2006 - at a growing, happy Lucky 7 Tattoo. Corey and I still living under the same roof. Amber, the young, smart and beautiful nursing student moved into Corey's life and bedroom. Me, Kathleen the Piercer, yet again tying the knot for the 4th time. The yummy icing on the cake being that this new husband, Russell, was the best man at my last wedding to THAT tattooer. Ha! Frankly the only good thing to come from THAT marriage was meeting the best man! As my taste for bad boys never changes, my brand new hubby is also a tattoo artist. AND golly gee, wouldn't you know, Lucky 7 was in need of another artist to fill out the staff. Corey and I have a sit down pow wow, carefully discussing all the ins and outs of what may happen if my hubby comes to work at the shop. What others close to us will and have said about our crazy situation That it cannot work. Its just not done, blah blah blah...and wouldn't you know it...we once again roll the dice and come up winners! Against the odds, Against the grain, Against the naysayers, the three of us forge ahead and GET ALONG FAMOUSLY! The shop hums along just fine, thank you very much. Matter of fact, having another family member on board only improves the overall performance of the business. Very little drama to be had. Both men act like men, not little boys, managing to become friends as well as coworkers. The reasons for overall success boils down to this. Neither Corey or I talked a bunch of smack about our failed marriage to our new life partners. We kept civil tongues when describing our ex spouse / business partner. Corey and I 's new loves never had to feel defensive and protective of our honor. nod their heads, feeling obligated to agree with casual trash talking of a bitter end. Lucky 7, Corey and I, well- we beat the odds of divorce. Managed what so many others have not. As of March 31st Lucky 7 turned 10 years old...and what a cool, crazy journey it has been. I have divorced and remarried a few times... my business partner Corey being one of those ....proved to the negative lames around here that yes, a tattoo shop could and would do well in Kings Beach. When I was cleaning up the front of the our building back in March of 2001, all tired and excited about opening our shop, I remember well an older local man walking up to me and saying "The last thing this town needs is a tattoo shop, it needs more liquor stores" or another choice morsal was a local Plumas County Detective walsing in out first day, with big blonde hair and lots of "cop like" attitude belting out "You got any warrents or arrests for drugs? You got a proper business license? Why did you open here? and my personal favorite "You gang members?" Ugh yeah, that is what Corey and I dealt with as we opened up our dream...lots of preconceived notions of what tattoo shops have NEVER really been. Let me close with a yummy tattoo done by my hubby Russell Kahey-Fortier a little while back. He loves black and grey....and is quite fond of skulls and the dark side. I will be posting weekely kids. So all 7 of you stay tuned!